In 1993 the former eastern bloc state of Czechoslovakia split into the two new republics: the richer Czech Republic and Slovakia. Most of the Czech Republic occupies the territory of the ancient kingdom of Bohemia, but also includes Moravia and parts of historical Silesia. 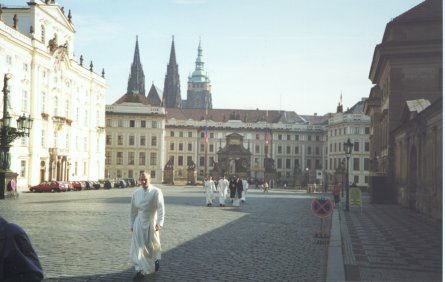 The Czech climate is more moderate than that of Slovakia, although easterly winds bring low temperatures in the winter. 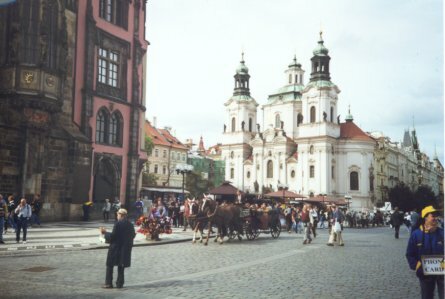 Tourism is now an invaluable source of hard currency for the Czech economy, and Prague is now a very popular tourist destination. Its many fine building makes it a serious rival to Paris as the most beautiful capital of Europe. Other aspects to appeal to the tourist are its many spa towns and skiing in the Carpathian Mountains. We took a coach trip from England to Prague, Budapest and Vienna. It's quite a common trip, and a number of companies do this circuit now, although they may differ as to whether the go clockwise or counter-clockwise, if you see what I mean. We went with Travelsphere - who subcontract to other coach companies for coaches and drivers. (Apart from one or two hitches, which happen to anyone in the real world, I can recommend them for value.) The driver who took us on the main trip picked up just before the Channel Port of Dover, and he managed to drive all the time on this trip, without a stand-in, and he did it just perfectly! Our courier also joined us just before we sailed. She was very pleasant, but had a slight accent - not a problem - but she made the mistake of asking if everyone could hear her. Some loudmouthed passengers - you do get them, don't you - indicated not very politely that the could not (meaning poor volume) and the courier got most upset (thinking they meant they couldn't understand/disliked her foreign accent). Very tense, near to tears, she got straight onto her mobile phone and arranged to swap with another courier at the next rest stop. (Imagine what he thought he was taking on!) This turned out quite lucky for us, for Dave turned out to be a very dedicated courier - he was a Canadian seeing Europe on his salary - and he provided everything from in-depth history to linked music (both a bit too deep at times for the less sophisticated among us). It took about an hour-and-a-half to get through the Czech border. This seemed normal for coaches - although cars seemed to make it through in minutes. We entered the Czech Republic at Pilson. It gave all passengers time to accept the challenge of finding a toilet - and then forming a very long queue - perhaps why they think you want to be a long time. Once we were rolling again, the initial approach was through woodland, where there were a remarkable number of cutely-dressed young ladies lounging at the roadside here, usually by a track into the woods. Now either they were waiting for a bus (strange place to wait near a border they clearly never cross, and strange there were so many bus stops so close together in the middle of nowhere), or they might just have been waiting for something else, offering a deal; clearly they liked air in their lungs - and on their bodies. After this little excitement, we entered Pilson proper. What a drab place - except that it was brightened up to our left by a vast selection of garden gnomes for sale ranging from normal to enormous. To our right we then passed the gigantic Skoda factory. It looked like a cross between a coal mine and a prison camp (someone told me they use/d prison labour, which might explain a few things), with a tall, barbed wire fence, heaps of coal, blackened factory walls, and buildings that went on for ever. Now Skodas might have been a joke once (this was the cracker all the jokes came from), but their Octavia is something in a different category, thanks to VW influence. We first saw them here, and they really looked quite desirable. Such a pity about the green cockerel badge they insist on sticking on the front. Dave took us for lunch at the Pilson Brewery - splendid chap that he was - despite it being a Sunday. We then motored on to Prague. We expected roads to be a bit primitive, but we were rather amazed at the long, straight motorway that took us all the way. We were also equally amazed by all the advertisement hoardings in the fields at strategic points along the motorway, advertising things such as expensive cars and computers. They seem really into computers! First sights of Prague are a surprise as well. It looks like the outskirts of Birmingham. Tall apartment blocks (drab), industry, and roads everywhere: those Skodas really have it made for them. After settling into our huge hotel, along with those from about a dozen other coaches, the contents of which it was quite capable of swallowing without any effort, and an evening meal there - average - we took up the option of a taxi to see the city by night - after heeding dire warnings from the hotel that if we failed to pick up the return taxis organized by them in the city centre, we should phone the hotel for assistance rather than risk being ripped off by venturing into a taxi ourselves! If taken by taxi, the trip into the centre of Prague is best accomplished with eyes closed - although no complaints about the vehicles, which were top models, and not even Skodas. The driver was very friendly, judging by facial expressions, but communication was an issue. We were glad he knew where to take us - and had our fingers crossed about the return arrangements. Suburban traffic goes very fast, and it is easy to loose your bearings if you're out of town, like we were. We were dropped off at the Old Town Square. Old, and perhaps the most inspiring part, it reminds one of a few other similar European squares (eg Bruges). The night-time illuminations of the buildings was splendid, and although late, some wooden-cabin market stalls were only just closing. Wandering round here, came out next surprise. Even taking into account that the standard of living in Prague is bound to be much higher than elsewhere in the country, to seen elegantly-dressed young people wandering round with mobile phones glued to their ears all over the place did shatter some illusions! These were countered-pointed by the few beggars, still as if set in concrete in their attitude of submission, only, maybe, allowing their eyes to move. You must, of course, watch the astronomical clock perform on the Old Town Hall - like you do in other European cities - and it meets your expectations. Another reminder for me of Bruges were the horse-drawn carriages that tourists can take for an expensive tour of the city. Peddlers here were selling novelties such as birds that chirped as you pulled on their string, and a strange and fascinating wire spherical contraption, all wires and springs, which can be twisted and manipulated into all kinds of shapes. It aims to exercise the fingertips and relieve stress: and is certainly more fascinating that a spongy stress-ball. Here's your chance to haggle, with the same thing being sold by adjacent peddlers at a variety of prices! They are continually demonstrating these things, and must do it in their sleep. 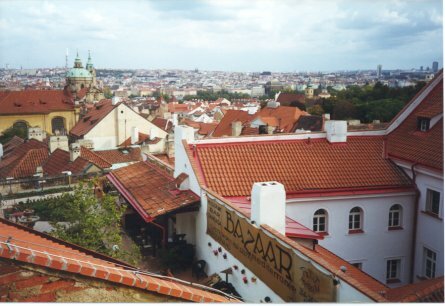 The next day Dave took us to Prague Castle - called hrad by the Czechs - up on a hill overlooking the city. It was founded in the 870s. According to the Guinness Book of Records this is the largest ancient castle in the world. Certainly, because of the many buildings within its confines, you tend to forget you are in a castle at all. its history goes back to the 9th century. Passing through arches between three courtyards you suddenly are confronted with towering St Vitus Cathedral, but you are hard-pressed to take a photograph of it because you cannot get far enough away from it. After admiring its external and internal magnificence, we wandered round to see photogenic Gold Lane. Originally built for 16th century sharpshooters of the castle guard, it was later used by alchemists and goldsmiths - when they decided to stop trying to make it from lead. In the 18th and 19th centuries it was occupied by squatters and later artists like Kafka. Now, guess what, it is occupied by gift shops. From the heights of the castle and the splendid and shady Royal Gardens, the view over the city's roofs and spires, gleaming across the river Vltava, is breathtaking. 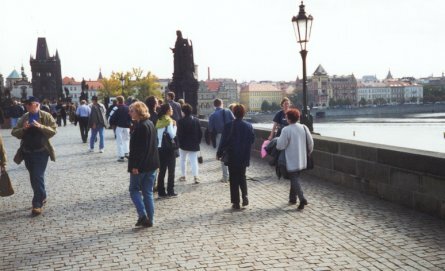 We descended steep steps and interestingly ancient streets to get to the famous - and now pedestrian - Charles Bridge. This was completed in 1400, and survived the onslaught of wheeled traffic for 600 years, so it is said, thanks to eggs mixed into the mortar. (If you are building a house next to heavy traffic, take note!) Here artists and pickpockets ply their trades for the tourists. Over the far side, keep wandering as straight as you can to reach the Old Town Square. From there it is only a short walk to Wenceslas Square and Prague's most famous landmark, the equestrian statue of St Wenceslas, the 10th century 'good king' of carol fame. This square is actually very rectangular, and very long, with a central garden strip, with turn-of-the-century buildings on either side. Here lies the ubiquitous McDonalds and stalls selling pale imitations. It is always a great relief to see the golden-M in foreign cities where you can't find anywhere else to be sure of finding relief! There are also various other eating places in this vicinity - although not as many as you might find in certain other European cities. I was not over-keen on the square, however, and would not go out my way to see it again! After an enjoyable stay in Prague, we departed the hotel. Even this was not straightforward. They had a gatehouse and insisted on correct paperwork every time a coach entered or left (ours was not quite correct) - to make sure a coach-load could not depart without paying their bill. What sort of visitors did they think we were? Next, after getting lost in the coach, trying to get out of the city in a 'clever' way, we eventually found miles of good motorway again, via the chopped off Slovak Republic. The split of Czechoslovakia into the Czech and Slovak Federative Republic, after communism had bowed out, took place in 1990, but old rivalries between the Prague and Slovakia began to drive a bigger wedge into the republic. As a result, in 1993, a bigger split firmed up the separate Czech and Slovak Republics. Most Slovaks danced in the streets - but with few assets, how wise was this, I wonder. Certainly the standard of living they now 'enjoy' is far lower than their Czech 'brothers'. When we stopped briefly at Bratislava, this seemed plain. While the transport system seemed extensive - mainly trams - there were not many images of wealth here. Apart from a small central area, Bratislava is another world, depressing, and most likely to gain fame for the inferior quality of its wealth of graffiti. But that small central area was quite nice. A green park area between buildings. Some rather fine modern buildings. Some interesting bronze statues to be found in casual poses around the place: like a worker appearing from beneath a manhole cover, and, what looked like 'Nelson' leaning over the back of a bench. A nice cake shop. Some gift stalls in the little market square with nice trinkets. After a brief drink in a genuine Irish pub, no less, we departed. By this time we had picked up a bit of the local currency - but a pity we didn't spend it on some of those trinkets. Back in England, even the notes counted for nothing: "There's no market for them, sir". And so, after crossing a not very blue Danube, and a halting movement through the border post, we crossed into Hungary. If you enjoyed reading the above article then you will probably also enjoy Tunisia by Ed, and London, also in Europe, and our latest articles covering the Orinoco Delta, La Mata, Marbella and Beijing.